Ardha Uttanasana or What’s the deal with half way lift? It’s a posture we seem to do a lot in vinyasa yoga classes but breeze right by without a second thought. So what’s the deal with Ardha Uttanasana? Often teachers don’t use the Sanskrit name of this pose. Ardha means half and uttansana is forward fold. So we get half forward fold. Well, first of all, you’re just fine where you are! Don’t try to force yourself into a deeper forward fold. We always want to honor our bodies as they are and know that change is always possible. There are things we can do to make your forward fold better, but that isn’t what this post is about. 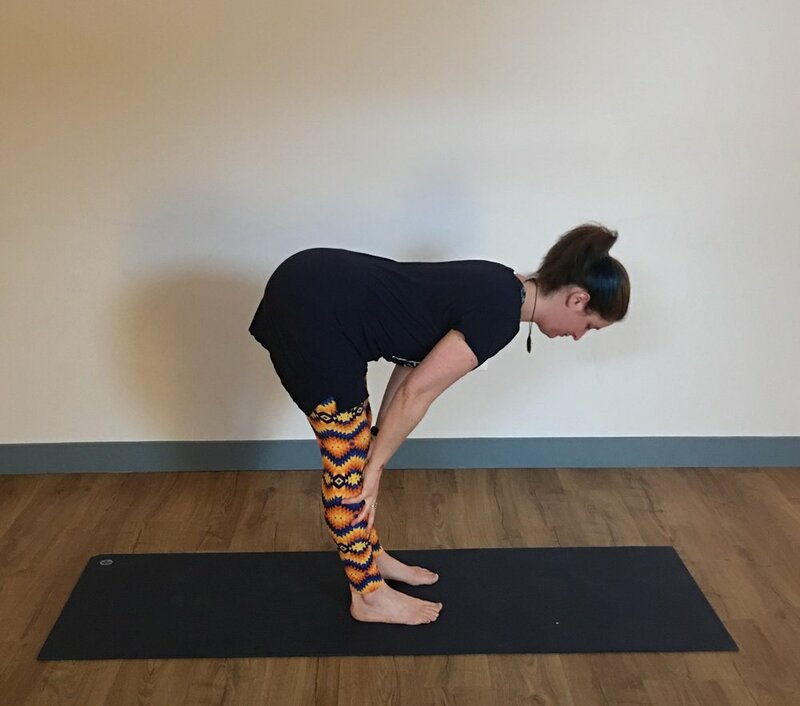 So, getting back to our focus pose, if someone tells you to “lift halfway” and you’re already about half way between the possibility of folding and standing, what’s a yogi to do? Consider what Ardha Uttansana is asking us to do. As far as shape goes, we’re basically making an upside down L with our bodies. That means that we want to lengthen our spine and strengthen our legs and our core support. So go back to that first picture of the posture. As always, we want to build the posture from the ground up, so feet are sit bones distance apart and pressing into the earth with arches engaged. Moving up from there, and this is the first important point, knees are not locked. Often when we lift the spine up into this pose we tend to throw the knee joints back and inadvertently lock them out. That doesn’t help us build core strength because it stops that flow of energy from the earth we’ve cultivated by lifting the arches. Instead of the muscles doing their work, we throw all the effort of pose into the joints. Total bummer and not what joints were meant to do. So if we keep the knees slightly bent we have more opportunity to strengthen. Next consider, where does that lift of the spine actually come from? Certainly, the muscles that run along the back part of the body are going to have to work here. That just makes sense. But wouldn’t it be nice if they didn’t have to do everything to fight gravity and achieve “lift off” on their own? Especially if you already have tight hamstrings or tend to experience low back pain? Of course! So that’s why we want to engage the core, as well as the belly/abs. I often think of this movement like a rising wave. When I’m lifting my spine up into the pose I actually think of lifting my belly first and then let that energy travel up the whole length of my spine. It’s like the spine unfurls in a wave that rolls out through the crown of my head. With that inner body support, my low back is fine and my spine can grow long. Does this look like my neck is happy? Notsomuch. So we contain that wave of energy we’ve brought up from the earth through the legs and into the spine just enough that it draws the head into line with the rest of the spine. With all of that inner body activation the back body (which is a group of much smaller muscles) doesn’t have to work as hard. But let’s go back to that back body for one more moment to check in on one very important spot. The shoulders. The shoulders draw up and on to the back. That stabilization helps those small back body muscles get the memo that they do have to do some work too. It also allows the heart to open a bit more which helps with one most excellent thing: getting a deeper breath! If you think about it you are most likely asked to inhale when coming into this posture. The shoulders engaged allow us the space to get that nice deep breath we need for whatever might be coming up next. Yay! So going back a bit, if you’re that person that can’t really touch your toes, what can you do in this pose and how can it benefit you? First, you can think about that spinal length we’re looking to achieve here. With that lengthening of the spine you are finding the space for a fuller, deeper breath. With that deeper breath IN is the possibility for a fuller breath OUT which may encourage your back body to release a little more into that full forward fold on the next repetition. Second, When you’re in this posture you can think more about pressing into the feet and getting the legs and therefore the hamstrings to strengthen which can (eventually) lead to more length (if I muscle feels like it can protect itself it is more likely to stretch. Strange but true). Third, most of us can always use work on our core strengthening. By supporting the spine in the way it needs to be supported you are more likely to start to relieve some of the low back pain so many of us complain about in daily life. And often, if you have tight hamstrings, they can pull on the low back and create some of that pain. By supporting the spine well, that may take the pressure off and start the process of finding a little more length in the hamstrings (remember that point about muscles needing to feel protected above). Finally, we can all benefit from getting a little more mindful in our practice. When we bring focus to one posture it can often open up new curiosity and then more mindfulness and possibilities in other postures. I hope that helps you feel more engaged in your practice of Ardha Uttanasana! If you have questions or comments, feel free to leave them in the comments below or ask before or after your next class.